Today we caught a monster warsaw grouper while deep dropping on a wreck we call the “Bill Boyds” in 265ft of water. Groupers and jacks are biting good around the wrecks this week, some of them extremely large. With the good action everyone is getting while trolling the reefs, many have left the wrecks alone. 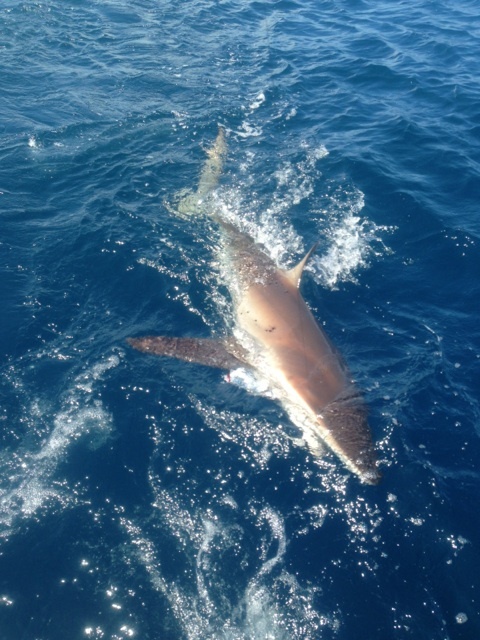 Some big fish are starting to gather there including groupers, amberjacks, cobia, snappers and sharks! Capt. Rod was at the helm today and we were deep dropping a live blue runner at the time. 1 second after the bait touched the bottom, we got the bite. The rod slammed down hard and Bobby (the deckhand) yelled up, “There he is! Go Rod!”. Rod threw the boat into forward and pushed the throttle. The object of this is to pull the fish away from the wreck, so he can’t pull you back into the wreck and wrap you around a rock. 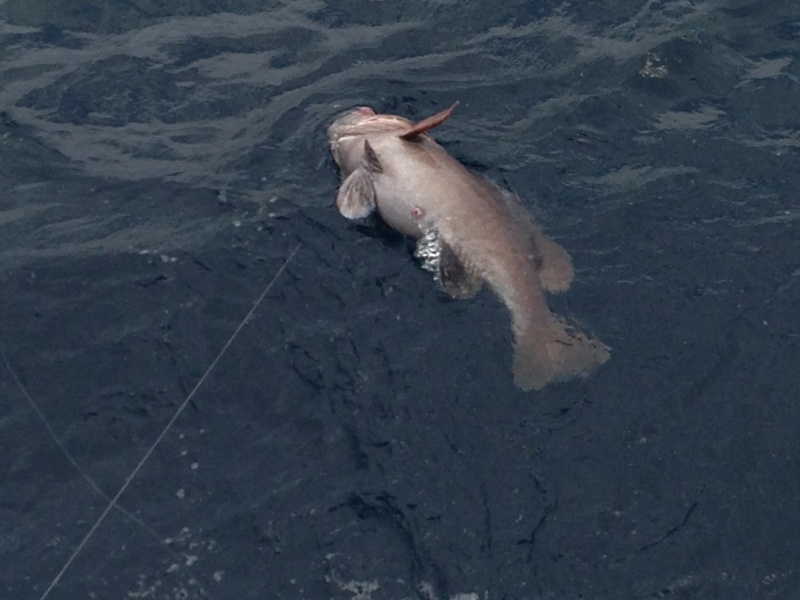 The grouper took a huge run, pulling line off the reel with maximum drag. When the initial run stopped, the angler began fighting the fish. After a couple more runs, the pressure seemed to let up some and we knew it was a monster grouper. Once you pull groupers up 75% of the way to the surface, their belly inflates with gasses and they float up. They breach the surface like a surfacing submarine. 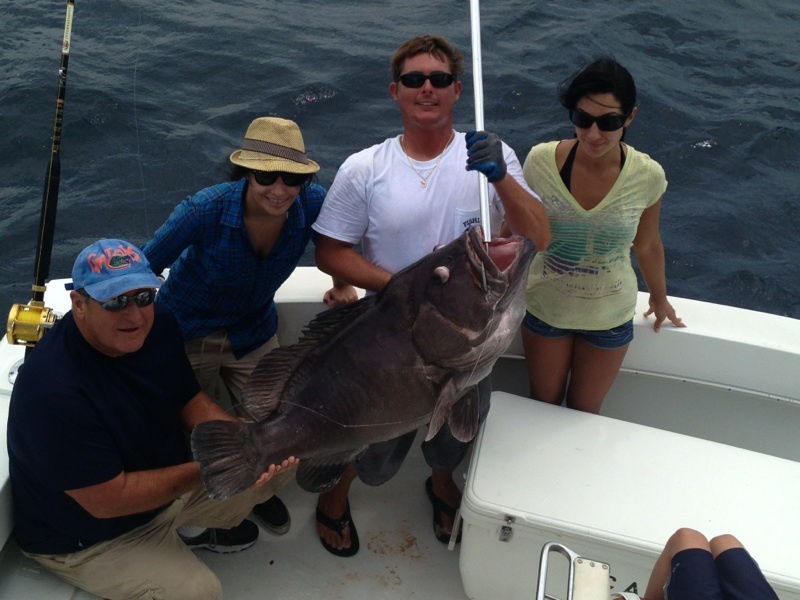 This grouper, a warsaw grouper, weighed over 50 pounds. Some incredible fish are being caught off the shipwrecks this week. 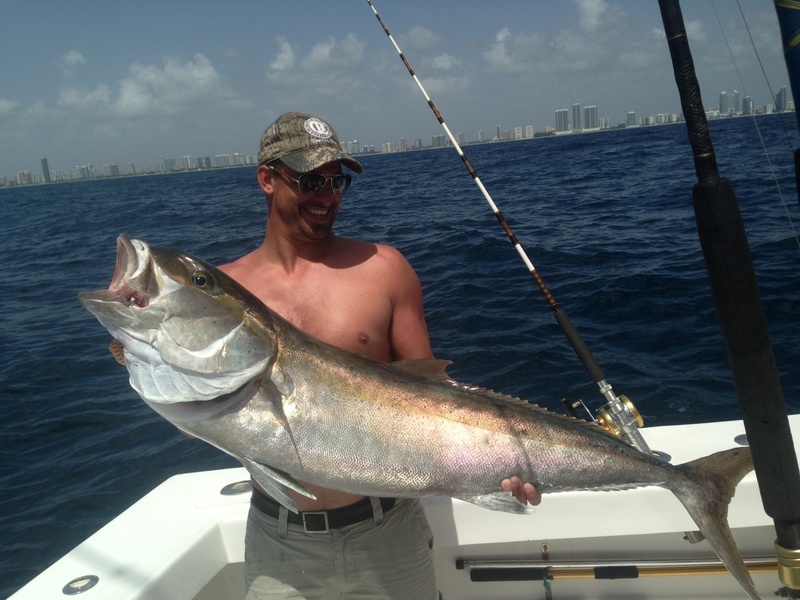 We caught a few really big amberjacks this week, and 2 nice cobias. We’re also fishing a lot of chicken rigs baited with squid to catch the small snappers and tilefish, both of which are biting well. We’re also getting plenty of action trolling the reef for bonitos and kingfish, occasionally catching a wahoo or blackfin tuna in the process. Action in general is very good this month. If there is any month where fish are a guarantee, this is the month. Good luck fishing everyone.